Republicans on Tuesday continued to bash President Obama as an incapable leader whose foreign policy has weakened the United States and emboldened its adversaries, primarily Russia. Sen. John McCain, R-Ariz., a foreign policy maven who is now one of Mr. Obama's top critics, railed against the president Tuesday during a 20-minute speech on the Senate floor about the Ukraine crisis. McCain said Mr. Obama is mishandling the situation in Ukraine, and other crises in Syria and Egypt, because he doesn't comprehend world affairs and geopolitics. "The fundamental problem is that this president doesn't understand [Russian President] Vladimir Putin," McCain said. "He does not understand his ambitions. He does not understand that Vladimir Putin is an old KGB colonel bent on restoration of the Soviet empire. ...This president has never understood it." McCain: Romney was right about Russia being "geopolitical foe"
} McCain provided examples from the last two presidential races as proof of Mr. Obama's flawed foreign policy. Russia invaded Georgia, its neighbor to the south, in 2008 while Mr. Obama and McCain were campaigning for president. When the candidates later met for a foreign policy debate, McCain condemned Putin's actions and delivered a warning: "Watch Ukraine -- This whole thing has got a lot do to Ukraine, Crimea, the base of the Russian fleet in Sevastopol." McCain also noted that during the 2012 campaign, Mr. Obama criticized and even mocked Republican presidential nominee Mitt Romney for labeling Russia "our number one geopolitical foe." 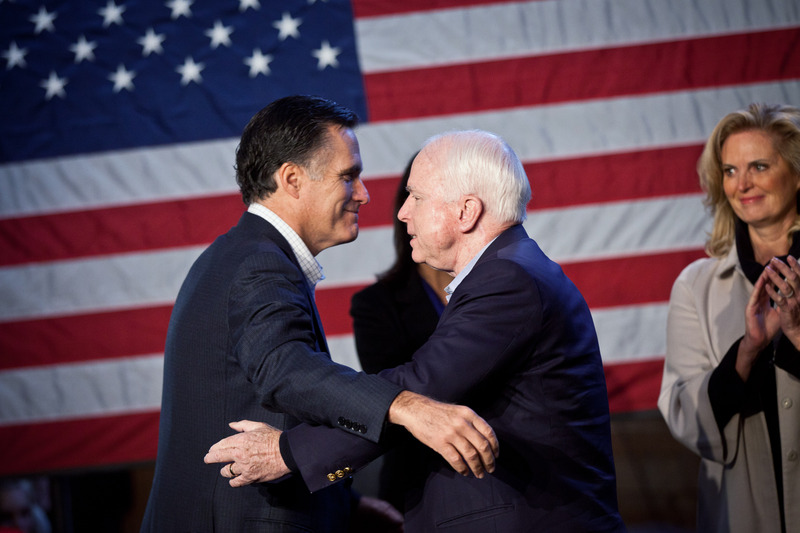 Romney was right, McCain said. "This president believes the cold war was over," McCain said. "Vladimir Putin doesn't believe the cold war is over." Instead of taking a slow approach to isolate Russia, McCain said the Obama administration should move quickly and decisively. He suggested Mr. Obama kick Russia out of the Group of Eight, initiate more travel bans on Putin's allies, establish stricter trade embargoes and immediately send a large economic aid package to the government in Kiev. Sen. Lindsey Graham, R-S.C., one of McCain's best friends and allies, also piled on the president. After criticizing Mr. Obama over the weekend as someone who "guts our defense," Graham also ramped up his criticism Tuesday in a series of Twitter posts. "It started with Benghazi," Graham said. "When you kill Americans and nobody pays a price, you invite this type of aggression. I think Putin believes Obama is really all talk and no action. And unless we push back soon, the worse is yet to come." Graham and McCain have teamed up before to hammer Mr. Obama's foreign policy. They were early critics of the president's restrained response to the Syrian civil war when it broke out in 2011. They have also said the rash of violence earlier this year in Iraq can be traced back to the withdrawal of U.S. troops, a major part of Mr. Obama's overseas agenda.